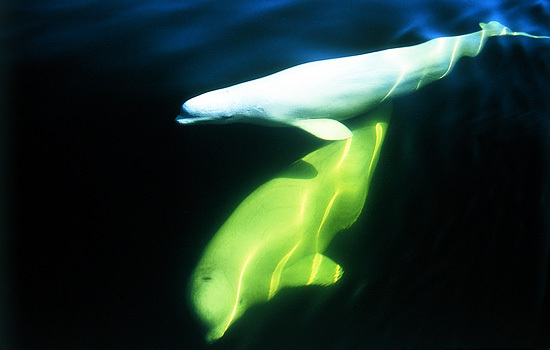 The beluga whale is one of the most unique members of the Cetacean order (which includes porpoises, dolphins and whales). These fantastic creatures can only be found in the highest waters of the northern hemisphere, which makes it somewhat difficult for wildlife fans to observe them in their natural habitat. Luckily, there is an, easily accessible location where travelers can see an abundance of beluga whales. Each year, these playful animals congregate in large numbers in the Churchill River. The inlet between this major body of water and the Hudson Bay is frequented by thousands of beluga whales each year as they come to calf. Canada Polar Bears offers over a dozen Churchill vacation packages. Whether you want to watch the nearly threatened beluga whales play or take a tundra buggy ride to get an up-close view of Churchill's impressive polar bear population, we have a trip that is perfect for you. Take a look at our wide selection of affordable Churchill vacations. What makes the Beluga Whale Unique? These medium-sized sea mammals have a unique shape and physiology that sets them apart from their closest relatives. Its vertebrae are not fused together like most cetacean, which means that they can move their heads laterally. The beluga is also one of the few whales that can swim backwards. One of the species' most distinct features is its dome-shaped head. Not only does this bulbous structure give the beluga a very distinct look, it can also be reshaped when they inhale or exhale. The evolutionary process of the beluga also phased out the species' need for a dorsal fin. The reason for this is unknown, but scientists believe it has something to do with survival in arctic climates. Much like dolphins, the whales are known to be rather playful. Some of their behaviors can be misconstrued as aggressive activities. For example, captive beluga whales have a tendency to spray water at their handlers. This can knock a person down, but the whale is not trying to hurt or frighten the target. There is so much more that sets the beluga apart from other aquatic mammals. If you would like to get an up-close look at these friendly creatures, there is no better place to go than Churchill, Manitoba. The late summer migration period offers a perfect opportunity to see massive communities of belugas in their natural habitat. Book your Canada	vacation today with Canada Polar Bears. Our staff has put together a wide variety of tour packages that are perfect for any budget. If you can't find a trip that suits your needs, let us help you put together a custom package that is perfect for you and your family! Need more information on Beluga Migration Tours in Canada? Talk to one of our Canadian travel Insiders who'd be happy to answer all your questions.